At the Public Health Reception organised by the Chinese Embassy, several dignitaries including the Deputy Minister of Foreign Affairs and International Cooperation 2, Isata Kabia, Chief of Defence Staff, Lt. General John E, Milton and a host of top military officers including the medical team of RSLAF, the Chief Medical Officer MOHS, Dr. Kargbo, top Chinese personnel and the fourth estate graced the occasion. In her speech, Madam Zuliatu Cooper recognised the role the chinese have played over the years in developing the capacity of the health sector in Sierra Leone. She gave a brief background to the work of the Chinese medical Team in the country which she said started in 1973 on to 1993. After the war was declared over, the team resumed operations again in 2003 as a result of a protocol signed between the government and the People’s Republic of China. They were initially attached to the Kingharman Road Hospital in Freetown. The medical team was sent in batches and each was to spend 2 years in the country. The CMT worked at King Harman Road Hospital for 13 years. Its composition was 9 doctors and one cook. These doctors were specialists in several fields: surgeon, physician, gynaecologist & obstetrician, ENT, ophthalmologist, anaesthetist, radiologist, paediatrician and Chinese traditional medicine (Acupuncture). The Deputy Minister further explained that in the wake of the Ebola outbreak, the CMT moved to the Sierra Leone-China friendship hospital at Jui in 2015 and the duration of the batches was reduced to 1 year. She then expressed her gratitude to the Chinese as their role during those trying times showed their commitment to the bilateral relationship between both countries even in the face of such an invisible adversary (Ebola). Coming to the present situation Madam Zuliatu Cooper commended the work of batch 18 of the CMT which is composed of 20 members: 3 specialized nurses, 16 doctors which included 1 orthopaedic surgeon, 1 general surgeon, 1 cardiothoracic surgeon,2 physicians, 1 Gynecologist,1 obstetrician, 1 ophthalmologist, 1 infectious disease, 1 radiologist, 1 ultrasound,1 Laboratory, 1 anaesthetist and 1 paediatrician. This team has been able to treat many critically ill patients including the performance of very complex operations like: surgery for large thyroids and giant fibroids, gynaecological cancer, trans-vaginal hysterectomy etc. and have helped to train local staff in modern technological medicine in their in-service courses. In the area of Internal medicine, the deputy minister said that the team has been able to administer chemotherapy, treat severe heart failure, hypertension, severe malaria etc. They have also given Chinese medicines freely to patients including accidents and emergency cases. She also disclosed that a replacement for the present group of CMT has arrived (Batch 19) and has the same number of staff and expertise. She recognised the support of the Chinese government in the form of donations to the hospital and the people of Sierra Leone. A new CT scanner is expected from the Chinese at the end of the year. Commenting on the service delivery of the team, Zuliatu Cooper said that the deployment of the CMT has further enhanced the service delivery of the hospital which has attracted many residents in the country to visit the facility and it has seen a drastic reduction in user fees During the operations of the CMT 2 brand new Lab equipments have been bought: a semi-automated biochemical analyser and a fully automated hematologic analyser from its internally generated revenue. This new team; Batch 19 will start operations in this month of June, she concluded. Chinese Ambassador H.E. 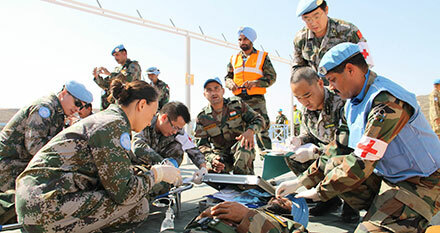 Wu Peng expressed delight and appreciation to all the guests and recognised the full cooperation of the 34 Military Medical Team had accorded the CMT. He also emphasised that their mission in Sierra Leone would not have been fruitful without the support of all the parties they partnered with. He had praises for H.E. President Koroma for the opportunity to serve in his country intimating that the close friendship with China is one that is highly valued and that through the Strategic Partnership of Comprehensive Cooperation established between the two leaders during President Koroma’s recent visit to China, will see the implementation of more Public Health Projects in the country. A toast to the mutual friendship between the two countries was made. Disclaimer: This article was originally produced and published by the Cocorioko.net. View the original article at Cocorioko.net.